Forgiveness and Trust – Not one and the same! COMMAND), to forgive anyone who has wronged us. It makes sense that the Father wants us to forgive each other. Look how He forgave us! We are all guilty in our sin, but by freely accepting God’s gift of salvation, repenting and turning away from our sin, accepting Christ’s sacrifice on the Cross for our sins, God will forgive us so we can be 100% sure that we are completely, undeniably – FORGIVEN. That said, there is a huge difference between forgiving someone and trusting someone. I know of many people who equate forgiving someone with immediately needing to trust them again. You can completely forgive someone but trust is earned. It may take years to trust a person whom you’ve forgiven. There are consequences in a relationship once trust has been broken between individuals. I remember so well a young wife who faced the utter devastation and loss of trust, when she discovered her husband’s infidelity. Thankfully in this case, they were able to salvage their marriage through counselling and the husband’s willingness to repent and ask forgiveness from his wife, his family and his church family. She forgave him, but I know it took years before that young wife was able to fully trust her husband again. He had to earn that trust! I’m sure everyone has experienced the disappointment of a friend who has betrayed a confidence. Gossip is truly one of the worst breaches of trust I know. I have had to forgive a friend’s transgression of sharing with someone else something I confided in confidence to her. To this day I still am very, very careful what I share with her. She still gossips so I am still very mistrustful of her. I forgave her, but I sure don’t trust her. That gave me pause to think…has God ever had to earn my trust? It’s a valid question. I believe in Him, I love Him, but do I trust Him? 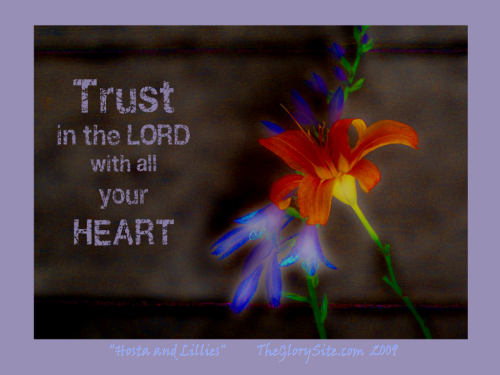 I know there have been many times in my life where God would certainly question whether I truly trust Him. My actions, my needless worrying, my wanting to do things on my own, following my way rather than His way…that speaks of my inability at times to fully trust God. Faith and Trust go hand in hand. Faith is trusting in God. The only way to have faith is to know God. Since He is trustworthy, as we learn to know Him, we spontaneously learn to trust Him. Faith is trusting God when things don’t turn out the way we expect. With my own personal journey with God, I have discovered that trusting God sometimes takes time. Over many years, as I grew in my knowledge of Him, I experienced more and more of His trustworthy character. As I continue to go through trials as well as triumphs and acknowledge God’s activity in my life, I am able to trust Him even more. I can personally say God has never disappointed me! Sadly, I don’t think He could say the same of me sometimes. This entry was posted in Inspiration & Devotion, Proverbs 16:9 - Journey Thoughts and tagged Disappointment, faith, forgiveness, gossip, Marriage, trust. Bookmark the permalink.